If you are looking for a dance lesson plan for your little ballerinas, then here is one that I use quite often with a circus theme, and the kids love it. This is the 4th dance lesson plan that I have placed on this blog for baby ballerinas. You can find a list of the other ones by clicking here. To warm the children up we sit in a circle on the floor and put on our make up. In this way, we can work the posture, fingers, and hands. We can then get dressed in our costumes and while we are doing this we can warm up other parts of the body like shoulders, feet, hips etc. Next, you will need a nice bright piece of circus music so that they can parade around the circus ring showing off all their costumes. Here you can incorporate walks on the toes, runs, low walks, stretched walks and even be certain circus animals. From this point of the class, it changes each time I do it. 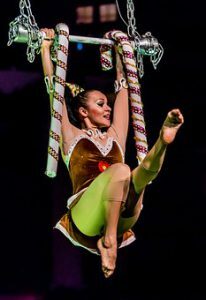 We just show the various circus acts. You can also have an interval where the children get to buy candy floss and popcorn to eat. You could also buy a balloon. Bring one to class and see if the children can keep it from falling to the floor. Here are some of the things that I do with the children. You won’t fit them all in, but you can vary and make different each time you use this dance lesson plan or theme. Tightrope Walkers – let them balance on a line and walk on their toes. They can mime almost falling off and then walking again. older children can try and do a leap and say on the line. 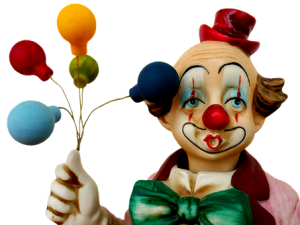 Clowns – They can lie on their backs and cycle their feet like they are riding their bike. This is excellent for their tummy muscles. With clowns, they could either do funny faces, do their own dance or do funny walks. The possibilities are endless. Ponies – This is a great way for them to learn pony trots, p ony gallops, and pony walks. Children also love to ride each other using a skipping rope. Trapeze Artists – They can work with partners facing each other here and hold hands. You can teach them to sway from side to side and gallop across the room holding on to each other. Poodles – Here you can get them to strengthen their upper bodies by walking on their hands and feet. Hoola hoops can also be used there for them to crawl through or jump over. Acrobats – Here we can strengthen our cores and practice things like rolls, cartwheels, handstands and backward rolls. Make sure to supervise the children well here. Magicians – I usually use a hat for this one as a prop. Some of the children can be the magicians and the other half can be bunnies hopping out of the hat or doves flying out of the hat. At the end of our Circus dance lesson plan, we can make a ‘parade’ walking around the ring and waving goodbye and curtseying to the audience. ← Barre In Ballet! Why Bother?